For other places with the same name, see Gaza (disambiguation). WARNING: The Gaza strip is an unstable area, effectively a war zone. While there are (even long) periods of inactivity, the situation can rapidly change. Enter at your own risk. WARNING: Western governments have issued a severe and strict travel warning against entering the Gaza Strip, due to ongoing military conflict. Most consider it effectively a war zone. The Palestinian factions and the Israeli military are well armed and quite willing to shoot when they think it necessary. The Gaza Strip (Arabic غزة, Ghazzah, Hebrew עזה 'Azza) is a Palestinian territory in the Middle East. The largest city is Gaza. Positioned between Israel and Egypt, Gaza has a reasonably modern infrastructure and architecture despite its troubles, but a UN report as early as 1952 stated that the Strip was too small to support its population of 300,000, and now there are well over 1.7 million inhabitants. The earliest known reference to Gaza is an inscription in the Temple of Amun at Karnak, Egypt, dated 1500 BC, which states that the town of Gaza is 'flourishing'. And for a long time it did: a staging post on trade routes connecting Asia and Persia with Arabia, Egypt and Africa, even the name means "treasure" in Arabic. Abraham, the father of the Hebrew and Arab people according to the Tradition, traveled to Gerar, city in Gaza, in approximately 1760 BCE, according to Genesis 20:1. Alexander the Great laid siege to the town in 332 BC, executing 10,000 defenders after being held off for two months. Later, the town was held by the Romans, the Crusaders, the Mamluks, the Ottomans and briefly even by the French in 1799, when Napoleon Bonaparte set up camp on his way to defeat in Egypt. The Turks took it back, then lost it to the British in World War I. The Egyptian army grabbed it during the 1948 war that led to Israel's independence, opening camps for Palestinian refugees - and the current situation began when Israel occupied the Strip in 1967. Spurred by the violence of the 1987-1993 Intifada ("Uprising"), Israel and the Palestine Liberation Organization signed a "Declaration of Principles on Interim Self-Government Arrangements" in 1993, under which the Palestinian Authority (PA) was created to govern the Gaza Strip and the West Bank for a transitional period "not exceeding five years" as a step towards full independence. Parts of the territories were indeed handed over the PA between 1994 and 1999, but the peace plans were derailed by the second intifada that broke out in September 2000, unleashing another spiral of violence. Israel unilaterally disengaged from Gaza in 2005, evacuating all Jewish residents and withdrawing its troops from the territory. It did however retain control of the airspace and the coastline in addition to the fact the entire region is circled by a large armed security fence. The Islamist organization Hamas won elections in 2006 and violently kicked out the remnants of the Palestinian Authority in 2007. Under Hamas rule, the rain of Qassam rocket fire, as well as mortars, from Gaza into southern Israel increased, and Israel responded by locking down the borders down tighter than ever and conducting raids against Arab militants. From December 2008 to January 2009, Israel launched a massive coordinated air, naval, and land offensive in response to rocket attacks. The Gaza Strip is a narrow, 40-km long slice of land between the Mediterranean to the west and the Negev desert to the east. Egypt lies to the south, the north and east border Israel. The urban sprawl of Gaza City, mostly stretching along and around the 3-km long Omar al-Mukhtar Street, covers much of the north. The other main towns of Khan Yunis and Rafah are near the southern border, with most of the rest covered with agricultural land. 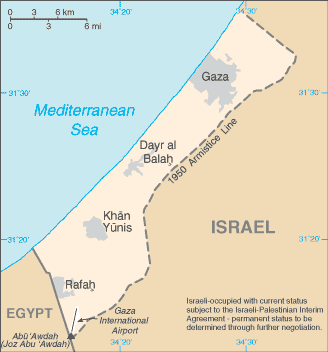 A bit of terminology disentanglement: Gaza Strip refers to the entire 40-by-6 kilometer patch of territory. Gaza City refers to the town itself, in the northern part of the strip, but due to huge population growth the City now sprawls into many of the surrounding villages and it's a tough task to say what is a part of the City and what isn't. Both city and strip are pretty much interchangeably referred to as Gaza and this guide will follow suit. Gaza has a temperate climate with mild winters and dry, hot summers in which drought is common. Flat to rolling, sand and dune covered coastal plain. Cultivated land. Getting into Gaza is difficult. Most would-be visitors from countries with diplomatic relations with Israel are required to apply in advance for Israeli permission to enter the Gaza Strip through the Erez crossing. The permission application is usually submitted through local Israel embassies and, in theory takes between 5-10 days. In practice, it can take months. The main point of entry to Gaza is from Egypt through the Rafah crossing. To enter the Gaza Strip through the Rafah crossing, visitors must obtain a permit from the Egyptian government. The crossing was reopened for traffic on June 1, 2010 though some restrictions still apply. Egyptian authorities control their side of the crossing with Hamas police operating the other side. However, Palestinians are permitted to cross into Egypt visa-free (except for Palestinian men between the ages of 18 and 40). As of 2015, the Rafah crossing is only open about 3 days every few months. Gaza has no functioning airport, as the former Yasser Arafat International Airport (IATA: GZA) has been shut down since 2000. The airport was badly damaged by multiple bombings - the most recent in 2009 - and is unlikely to reopen in the foreseeable future. The Israeli Air Force monitors Gazan airspace with radar, and regularily sends patrols of drone aircraft and fighter jets over Gaza. A surveillance balloon is also tethered at the Erez Crossing. For the time being, the closest airports is El Arish International Airport in Egypt, or Ben Gurion Airport in Tel Aviv. The main point of entry is the Rafah Crossing in the South, on the border with Egypt. Egyptian authorities have built a wall on it, and the only way in is through a road called the Philadelphi Route. The route is controlled by Hamas, and the point of entry and exit is controlled by Egyptian Police. On arriving at Rafah, show your passport, the Egyptian permission letter and the Gazan-based organisation invitation letter to the guard at the gate. You will have to wait for between 10 minutes and 1 hour while they authenticate your documents. On completion, they will invite you to enter the crossing through the gates. The second point of entry is through the Erez crossing in the north, on the border with Israel. You will need a permit from the Israeli Army, or a GPO (press) card. If you have a permit, you need coordination with the Israeli Army, specifying when you are planning to enter and leave Gaza. Journalists with a Government Press Office (GPO) card can come and go as they please. Only vehicles with prior coordination (such as a handful of UN cars) are allowed to drive in and only after a thorough search, which may take months. It's very helpful to travel with someone that's run the gauntlet before the first time via Erez. At Erez, you have to approach the Israeli soldier in a pillbox. They may ask you to open your bags on the table, and (as at TLV) ask if you have weapons. They will check your passports and permits for allowed entry. You then wait outside an electronic gate for your turn to be called through. You then enter the terminal, hand your passport and coordination over to another soldier to receive an Israeli exit stamp. They may or may not ask you more questions -- usually things like "first time in Gaza", etc. If everything is satisfactory, take back your documents and follow the signs directing you to Gaza. After exiting the terminal, you end up in a long barren concrete tunnel. Don't bring anything too bulky as you'll have to go through a turnstile gate. Coming through the tunnel, you cross a no-man's-land. This is at least 1000m long, and has lovely views of desolate, and presumably mined, land. Palestinians* are allowed in this area so you may be lucky and find a porter, trolley, wheelchair, or similar. Take it. If you take the tuk-tuk, keep your hands inside the vehicle at all times and enjoy the ride. After the gated tunnel you will emerge near a small hut. This is a checkpoint which can be ignored on the way to Gaza (but ignored at your peril on the way back). Since 2012, the only people here will be a few taxi drivers. Take a taxi to the Hamas checkpoint, another 800m down the road. The going rate is ₪3 per person. You will be searched for unlawful items (make sure you are, it's the hut to the right. Also visit the hut to the left to check your Hamas credentials -- new since October 2011). Prohibited goods include alcohol, banned by the Hamas government. If you fail inspection, then at best, your items will be confiscated. Once you are through, you can take another taxi, or more likely be picked up by your local contact. The port of Gaza is non-operational, and Gazan waters, seaports, and the coastline are patrolled by the Israeli Navy. If you attempt to reach the Gaza shoreline by boat, you will be stopped by Israeli naval vessels, and turned back by military force. Only boats with prior permission are allowed in. All boats coming from Gaza are only allowed to venture 2-3 nautical miles into the sea in order to enforce the Israeli naval blockade. Since the 2012-2013 events in Egypt, it's been much easier to come through the Rafah crossing for all people from all nations. After being deposited at the Hamas checkpoint near Hamsa, go to the white caravan to your right to get your exit clearance. Once through, take the taxi (₪3/person) to the forward checkpoint (where the wire fence begins). Then, go to the hut on the right. A man will take your passport and call ahead to tell the Israelis you're coming. Ignore this at your own peril. Once you get your passport back, take the tuk-tuk if possible, or begin the 1km+ walk to Israel. When you reach the end of the tunnel, you'll see several doors. Once a handful of people have gathered, one of the doors will open (indicated by a green light on top of the door). You will then enter a hall with a table at the centre. Open your bags at the table (there are no obvious signs to do this, but look up and there's a camera. They are checking for obvious things like large bombs). When they've ensured you have no prohibited items in your bags, go through the turnstile when the light flashes green. You will not receive a verbal "OK", but rest assured you will be shouted at in Hebrew if you're not ok.
You will see toilet facilities to your right. Use them. Follow the arrows to Israel. You will then encounter another hall with eight doorways. Wait until one of the lights go green then enter that doorway. Leave your bags with the porter at a large security scanner. You should remove all electronics not just laptops, but things like disk drives, mobile phones, etc) and place them in the large trays. Remove your belt, watch, etc too. Keep your passport and ID on you and enter a series of gates as the lights flash green. When you come to the body scanner (a MMW scanner), put your feet on the markers and place your hands over your head in an "I surrender" pose. Keep your passport in your hands. If you've passed initial screening, you will be allowed out to a hall where it appears as if your bags will emerge on a conveyor belt. There may even be empty trays circling it. Walk straight through to the departures hall, as your bag will be selected for a hand search. On your left in a row where trays with bags will gather, and you can see the guards searching your bags. Wait patiently. If you haven't passed initial screening, you'll be directed through further scanning. There is a separate section that will reveal itself to you if the guards in the gallery above find the need for a strip search. Once you collect your belongings, you will finally pass through Israeli entry, and get a new stamp in your passport. Exit from Gaza could take from 30 minutes to several hours. The checkpoint closes at 14:00, or even earlier. If you are stuck between Hamas and Israel phone your embassy for assistance. There are numerous service (ser-VEESS) taxis in Gaza and several privately owned bus services. Navigation is done by landmark, not street address. Stand on the side of the road that is in the desired direction of travel. When a driver stops indicate the destination landmark e.g., "Shifa" and the number of passengers ("wahid" for one, "it-nayn" for two.) If the driver is not headed that way, he may drive on. Travel up and down Omar al-Mukhtar St. will set you back ₪1; trips elsewhere are negotiable. Near al-Shifa hospital is a line of taxis that travel to destinations beyond Gaza city. The drivers yell out their destination and wait until their vehicle is pretty much full before they leave. It is advisable to watch your step if walking, since traffic is chaotic and sidewalks are largely non-existent. Gaza "city" side walks are everywhere, its not preferred to take a public taxi, if you call a taxi office they will send you one alone, it's much safer. The standard language is Arabic. English is widely understood and spoken, Hebrew is also understood to some extent. Qasr al-Basha (also known as Radwan Castle and Napoleon's Fort) was formerly a large palace, and now a popular museum, situated in the Old City of Gaza. It served as a seat of power in the Mamluk and Ottoman periods and as a police station under the British Mandate. The museum's Department of Antiquities exhibits numerous notable items from their collections, including Roman, Persian, Hellenistic, Phoenician, Ancient Egyptian, and Neolithic artifacts. The Great Mosque (Jamaa al-Kabir) Gaza Great Mosque is one of the most interesting ones in the Palestinian territories, and the oldest monument in the city. It was initially an early gothic church built in the XIIth Century by the Knights Templar who then held Gaza. It was enlarged as a mosque, with a minaret added, under the Mamluks in the XIVth Century. The mosque much suffered from shelling by the British army in 1917 (the minaret was destroyed, with large parts of the gothic crusader structures) and was restored under the British Mandate. The Church of Saint Porphyrius is an Orthodox Christian church of Gaza, and the oldest active church in the city. Located in the Zaytun Quarter of the Old City, it is named after the 5th century bishop of Gaza, Saint Porphyrius, whose tomb is situated in the northeastern corner of the church. The church itself was probably built in the XIIth Century, when Gaza was a Christian city guarded by the Knights Templar. The Funduk Al-Mathaf (Museum Hotel) is another museum in Gaza, located inside a seafront hotel, which holds over 350 antiquities discovered in the Gaza Strip from various historical periods. It contains a restaurant, hotel, and conference center. Hamam al-Sammara.is one of the active saunas in Gaza. Different hours for men and women, excellent service and a proper scrub down. Between Palestine Square and the Saladin Road. The Gold Market (Qissariya Market) is a historical passageway located in the old quarter of Gaza; it is both a center for trading and buying gold, and location for foreign exchange. The Gaza Baptist Church is a modern Baptist church in Gaza. The church is the only Evangelical church in Gaza. The church opened Gaza's first public Christian library in 2006. More educational might be a UNRWA-arranged visit to one of the refugee camps that dot the strip. The UNRWA office is on al-Azhar St, near the Islamic University, call ahead to see if they can arrange a little tour. Your most probable destination is the optimistically named Beach Camp, a warren of concrete huts and open sewers housing 63,000 people, built next to a sandy beach - and you can walk there on your own, 15 minutes to the north from the intersection of Omar al-Mukhtar St. with the seafront road. UNRWA wisely recommends avoiding military clothing. The Jabaliya refugee camp is also a nearby option. Gazans use the Israeli shekel (₪) Please note the policemen at the Hamas checkpoint into Gaza are now opening all bags and disposing of alcohol (since early 2009). Do not bring alcohol into Gaza, it could land you into trouble. Interesting sculptures / lampshades fashioned from old cigarette cartons. Foustouk and simsimiya. The former is a sticky peanuty snack. The latter is its sesame cousin. The Gold Market (Qissariya Market) is a historical passageway located in the old quarter of Gaza; it is both a center for trading and buying gold, and location for foreign exchange. There are many gold and jewelry shops in the Gold Market, in addition to foreign exchange shops. Popular Arab fast food like falafel and kebabs are available everywhere in Gaza. Head to the posh suburb of Rimal for fancier food; the restaurant in the Windmill Hotel is nice. Also keep in mind that if you wish to bring in any food products, you should first check which products are allowed in Gaza under local custom laws. If you are caught with prohibited food, it might lead to trouble with the authorities. Finally, it is not unheard of to be invited over for dinner. if you to Gaza, you must try eating kunafa but from "abo el sood" ask anyone they will give you the directions, beside it is a souvenir shop. Due to increasingly strong Hamas influence, alcohol is no longer available. The last place for a visitor to drink was the UN Club. If you are caught with booze by Hamas authorities, it will be confiscated. There are many hotels in Gaza. It is also possible to stay with locals who might even invite you over for a night. mazzaj brings you everything you wish from western to eastern meals it really famous. Realistically, if you are not either an aid worker, journalist or diplomat, there is no work for you in Gaza. There are a number of NGOs offering internships, however, such as the Al-Dameer Association for Human Rights in Gaza, the Palestinian Center For Human Rights and others. WARNING: WARNING: The Islamist group Hamas is classified by the US State Department as a designated Foreign Terrorist Organization (FTO). It is a violation of United States federal law for United States citizens to provide "material support or resources" to the Hamas organization. WARNING: WARNING: Gaza remains a conservative area, and public displays of affection are forbidden. WARNING: WARNING: Homosexuality is illegal for men in Gaza and punishable by up to 10 years in prison. While not explicitly illegal, homosexuality amongst women is not well tolerated either. WARNING: Be careful in Gaza: stay away from demonstrations, and stay off the streets at night when most of the clashes happen. Especially avoid areas near the border where airstrikes and gunfire are not uncommon occurrences. Israeli forces heavily guard the border, and you may be shot as an intruder if you are spotted approaching. Also avoid police stations and government buildings, as these are subject to Israeli attacks during military operations. Journalists and other foreign nationals have been kidnapped by various local groups. The Gaza Strip is occasionally subject to Israeli military operations (which include aerial and naval bombardment as well as ground incursions) as well as armed confrontations between the Hamas authorities and Fatah factions. While Hamas has managed to curb crime levels in Gaza, some members have been known to beat journalists attempting to cover demonstrations against Hamas. In general, use common sense and avoid these kinds of situations. Consult your embassy for advice and current conditions before setting out. Unlike the West Bank travel documentation does not need to be kept at hand at all times. It's also worth bearing in mind that Gaza's power station and its substation have been severely damaged by Israeli airstrikes and no longer function at the intended capacity. Power outages are very common since the European Commission handed over control of the fuel obtainment to the Palestinian Authority in 2009 as Hamas has so far failed to pay 20% of the fuel costs. Currently, these outages are countered by large industrial and small commercial diesel generators which combine to create a cacophony that the locals have somehow become desensitised to. Some of these generators are poorly maintained and leak carbon monoxide. Visitors should be wary of this, particularly in enclosed spaces where it has proven fatal. See also War zone safety. Much of the underground water aquifer in the Gaza Strip has been contaminated by waste and sea water leaking into the water system. As such, tap water is generally not safe to drink. Travelers are advised to purchase bottled water whenever possible. Women should dress modestly, especially if entering refugee camps. Men and women are obliged to dress appropriately at religious sites such as mosques and churches. Respect local customs and behave appropriately in front of authority figures in Gaza. This page was last edited on 7 March 2019, at 19:04.